Luxury Adventures are conducting a series of interviews with some of our key suppliers looking at the different aspects of their lives and how these influence the experiences they offer. 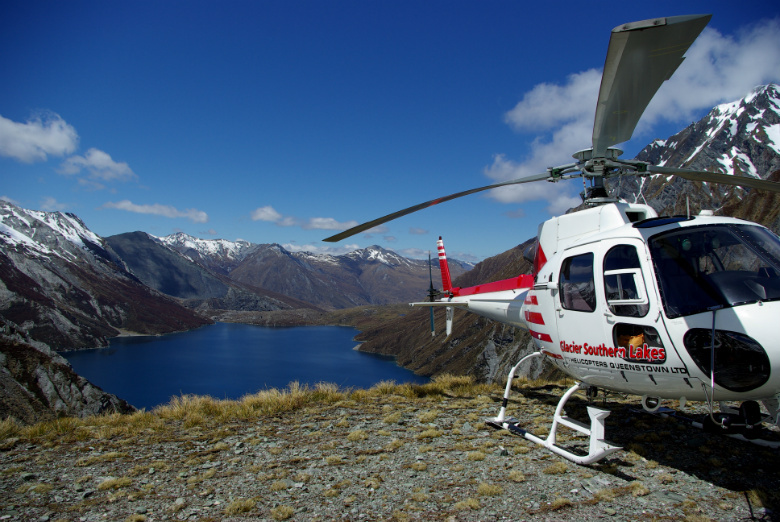 Glacier Southern Lakes Helicopters are located at Queenstown Airport, South Island, New Zealand. GSL flies over some of the most spectacular and remote terrain in New Zealand bar none. Is a day spent in the Fiordland or Mt Aspiring National Parks enough to get good taste of the region? Absolutely! Consider for a moment that Fiordland National Park is 1.2 million hectares in size and Mt Aspiring National Park is 350,000 hectares. Visitors are only ever going to be able to take in a fraction of that if travelling on land. By air they are going to get a greater sense of the true scale of this area (which makes up part of New Zealand’s UNESCO World Heritage site – Te Wahipounamu South West New Zealand) and by helicopter we can take them deep into the heart of one of the great natural areas of the world by landing in places that would otherwise be totally inaccessible. Glacier Southern Lakes were instrumental in filming the Peter Jacksons ‘Lord of the Rings’ trilogy and now the soon to be released Pt 1 of the ‘Hobbit’ trilogy. As I understand it GSL filmed most of the ‘Hobbit’ aerial shots with your in-house pilot Alfie Speight – How did you land this coveted part? When it comes to filming it really is all about Alfie. His reputation precedes him and he is regarded as the go-to guy when it comes to aerial filming in New Zealand, so when he joined the Glacier Southern Lakes team he brought a lot of filming business with him. In saying that though, GLSH owner Pat West also has quite an established history in aerial filming and co-ordinating too so between them they have worked on most major movie projects that have come to the area such as ‘Vertical Limit’, ‘10,000BC’, ‘Peter Pan’, ‘King Kong’ and the ‘Narnia’ and ‘Lord of the Rings’ franchises. When Alfie’s not booked with film work it’s a great treat for our guests to have him as their scenic flight pilot. Helicopters are fascinating or at least I think so! Tell me about your current machines and do you have any plans for new ones? We own four AS350 Eurocopter Squirrel helicopters. Three of these are B2 models which you can think of as the V8’s of helicopters. The Squirrel’s take up to six passengers (two in the front seat beside the pilot and four across the back). They are a great machine due to their versatility – great for scenic flights because they are like sitting in a goldfish bowl so you can see everything around you (even in the back seat!). They are also well designed for some of the other work we do, such as filming, heli-skiing and heli-biking and commercial work such as lifting and fire-fighting. Over busy periods we also lease or charter in more machines so we never really have any issues with capacity. Safety is number one for us when it comes to helicopters and who to use. Sometimes customers can get frustrated when trips are postponed or delayed, especially when the sun is shining in Queenstown! However we know that’s often not the case west of the main divide – talk us through your safety approach before heading to Milford/Doubtful Sound or Fiordland National park? Yes weather plays a big part in what we do and unfortunately none of us have figured out how to control it yet! Our pilots first job in the morning is to assess the weather. They do this using a combination of online weather reports, webcams, and talking to the air traffic control tower in Milford Sound. Their first weather assessment is usually with the flight operations team by 8am and then is continually updated throughout the day. Poor weather prevents us from flying to Milford more than 100 days a year however safety is our number one priority. Obviously for guests this can be frustrating but the other thing to remember is that if the weather is bad or even marginal it’s not going to be a very pleasant experience for you in a helicopter, we don’t fly if we know that the turbulence will be bad or if we know there’s too much cloud to actually see anything during your ‘scenic’ flight. To combat all this we always recommend that guests book their flight at the start of their stay in Queenstown, so if weather is unfavourable the first day we can reschedule them to the next day. Most of the time this strategy does work and we are able to give guests an amazing experience. For those few that do miss out it just means they have to come back to holiday in beautiful Queenstown again! A common question we get asked from customers is ‘We want to see Fiordland but don’t know whether to visit Milford or Doubtful Sound? Whats your answer to that, one or the other or both? That’s a tough one, both are amazing. I think that the answer comes down to how much time and money guests have. Personally, if I was designing my dream itinerary I would do our Fiordlander flight which includes a glacier landing, flight over Milford Sound and out to the West Coast, then lands at Lake Quill for a gourmet picnic lunch before returning to Queenstown. The next day I would head down to Manapouri, which is about a 2 hour drive through some great rural countryside. Then I would do an overnight cruise in Doubtful Sound, along with some kayaking and hopefully a bit of fresh seafood for dinner. I think this would be great because you get to experience all parts of Fiordland and from both the air and the water – and there is definitely value in both. Another common question asked is from people wanting to land on a glacier and the misconception that you can only access this from the West Coast. As we both know there are a few options ex Queenstown – Expand on these options and your related ‘Concessions’. When it comes to glaciers Fox and Franz Josef on the West Coast do tend to steal all the limelight. But the fact is there are hundreds of glaciers throughout the Southern Alps. The flights available on the West Coast are quite affordable because the helipads are based so close to the glaciers and there is not a lot of flight time involved. From Queenstown we hold 70% of the glacier landing concessions within Mt Aspiring National Park and also have DOC concessions for the Ngapunatoru Plateau of Mt Tutoko in Fiordland which is the glacier we land at during all our Milford Sound flights. While our glacier flights are more expensive (because we have further to fly) the glaciers we have access to are quite different but just as impressive as the long snaking glaciers on the West Coast. Guests experience greater variation of terrain along the way. There’s rugged tussocky valleys around Skippers Canyon, barren schist, rocky slopes, a touch of beach forest around Glenorchy and then the blue-green ice falls all around Mt Earnslaw which seem to cling onto the rock faces with all their might. – Kinloch Ledge on the Southern Humboldts – for its great views of the top of Lake Wakatipu, Glenorchy and the Dart Valley – it’s where we often stop for our picnic lunches. – Lake Erskine is also another spectacular alpine lake which sits high in the mountains of Fiordland, surrounded by sheer cliffs with just a small outlet for water to cascade into the valley below. – Transit beach on the wild West Coast which is near the entrance to Milford Sound is a great example of the ruggedness of the coastline. Apart from the specialist interests such as hell-hiking, hell-fishing etc. a picnic in the remote Fiordland mountains is highly sought after. What do you include in your picnics and what type of experience can our customers expect? 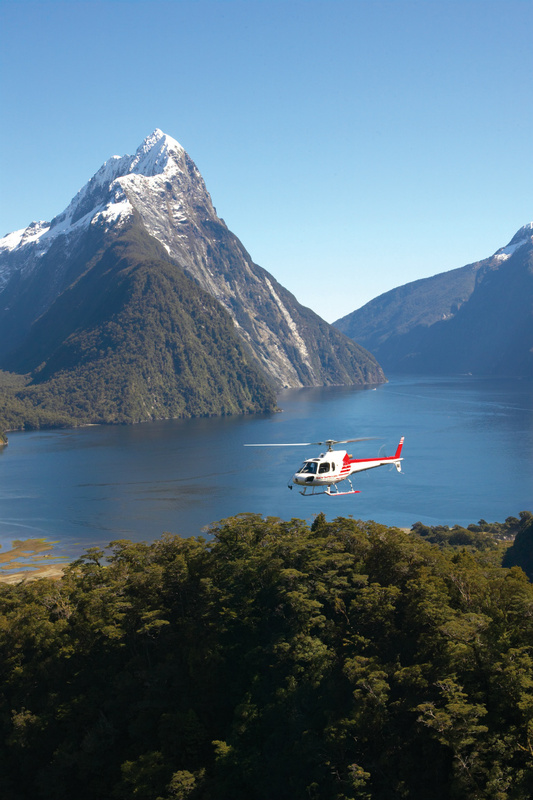 Our premier and private charter flights allow guests to explore Fiordland in greater detail and get right off the beaten track. The highlight of these flights for guests is shutting the helicopter down on a remote alpine peak to enjoy a gourmet picnic. We get our platters from local deli Mediterranean Market and they contain a great selection of meats, cheeses, fruit and fresh bread and always receive great feedback. This is accompanied by a selection of Central Otago wine or Champagne. These flights are real once-in-a-lifetime experiences and they are very popular with couples. 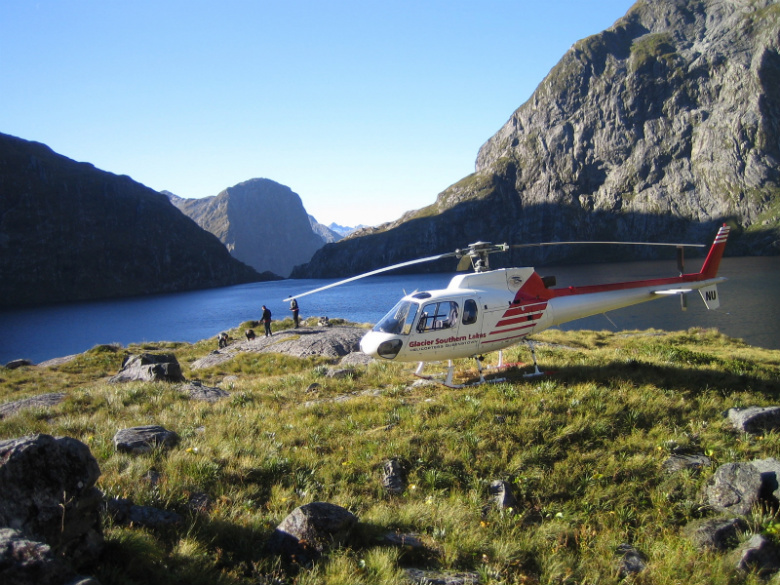 Our Fiordlander flight with its landing at Lake Quill would be one of our most popular flights and we get a lot of proposals and honeymooners who book this flight as it definitely fits the bill for those seeking something special and romantic. Slightly off topic – I’m involved in Search and Rescue on a voluntary basis in Auckland so have an interest in it, does GSL make its machines available for SAR operations? As part of the Lakes District Air Rescue Trust, GSLH has been involved in Search and Rescue and medical evacuations for many years on a rostered basis. The winter season in particular is a busy medivac period with many transfers off the local Southern Lakes skifields required. Other callouts may see us involved in cliff rescues, car accidents and transfers to base hospitals in Invercargill and Dunedin for patients requiring urgent medical care. You must have flown some interesting people and all sorts of trips over the years, tell us about one to two of the more interesting ones? We’ve had lots of interesting guests over the years however one flight that stands out is three guests we flew last year from Australia. The first day they did our Fiordlander flight, then they came back the second day for a very specific private charter. One of their main goals of their Queenstown holiday was to build an igloo. So before leaving Australia they had ordered specialist igloo making equipment online from the US and brought it with them. Then we flew them to a suitably safe area on the Clarke glacier, shut down and they spent 3 hours building this igloo. As time was short they even persuaded pilot Steve into helping to shovel snow. When completed, they proudly erected their Australian flag and cracked open some beers. They claimed that had they given it more time to set it would have been strong enough to support someone standing on top of it. They continued to email us for weeks to find out how their igloo was going and whether it was still standing. Luxury Adventures has been using you for over 12 years now with your experience playing a large part in this – Have your pilots been with you for a long time and what are the average ‘pilot hours’ accumulated amongst your team? The experiences we provide will only ever be as good as our pilots so fortunately right now we have the most experienced team of pilots in Queenstown. Pat, Stefan, Alfie, Andy, Brendan & Buck are all Kiwi’s who all have at least 6,000 flying hours and the majority of their flying has been completed around the Southern Alps so we couldn’t ask for a better team. You’re lucky to be able to see some of the nicest spots in New Zealand on a regular basis, but when you’re not in the mountains where are some of your other favourite spots in NZ? While we all love living in Queenstown, most of us at GLSH like to head to the coast when we want to get away from it all. Stewart Island and the West Coast are great for some time out and for a spot of fishing or hunting. Forsyth Barr Stadium in Dunedin is also a popular destination if the All Blacks are playing!